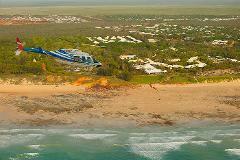 Experience the captivating views of the world famous Cable Beach while flying north over Willie Creek Pearl Farm. 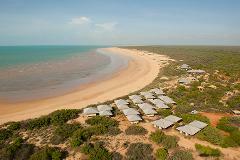 On your flight back marvel at the views of the Broome Peninsula, Gantheaume Point and Chinatown. Marvel at the views on your scenic flight north up Cable Beach and past Willie Creek before landing at a remote beach where we set up a gourmet picnic and sparkling wine dining experience on the beach. Fly north along world famous Cable Beach, around Willie Creek and along stunning remote coastal beaches including Barred Creek and Quondong Point, known for their distinct red cliffs, white sandy beaches and azure waters. Marvel at the azure blue waters, muddy creeks and picturesque coastline as you head south from Broome to Ramada Eco Beach Resort. Package includes an a-la-carte lunch (with complimentary glass of wine, beer or soft drink). Fly north along world famous Cable Beach, past Willie Creek and stunning remote coastal beaches including Barred Creek Quondong Point, and north to James Price Point famous for its distinctive red cliffs, white beaches and azure waters. Take a scenic flight to the spectacular and little known Edgar Ranges, south east of Broome, where you will land on or near one of the incredible Twin Buttes for an amazing view of the ranges. Take a spectacular flight over the pristine Dampier Peninsula before landing at Cygnet Bay, home of Australia's oldest pearl farm, or Kooljaman Resort at Cape Leveque. 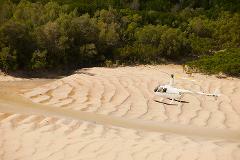 Return via the spectacular Kimberley coastline. For experienced fishers with all your own equipment, let us take you to a spectacular remote fishing location accessible only by helicopter. Be amazed at the range of fish you'll catch, including the legendary barra! 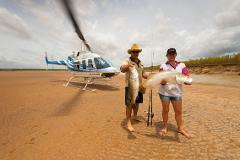 Let us take you out of Broome to a spectacular remote fishing location accessible only by helicopter. Be amazed at the range of fish you'll catch, including mangrove jacks, cod, salmon and even the legendary barra! Take a scenic flight to the spectacular and little known Edgar Ranges, where you will land on or near one of the incredible Twin Buttes for an amazing view of the ranges. Make a day of it by returning via Eco Beach for an a la carte lunch! Experience the Horizontal Falls, one of the natural wonders of the world. 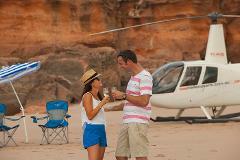 Fly by light plane from Broome to Derby, then a spectacular helicopter flight out to the Falls. Take an exhilarating boat ride through the falls. Lunch included. 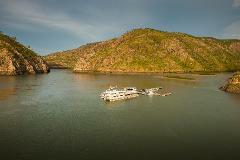 Experience the Horizontal Falls, one of the natural wonders of the world. Fly by light plane from Broome to Derby, then take a spectacular helicopter flight out to the Falls over the Derby mud flats and through the Kimbolton Ranges.